For a full programme, please see below. Tickets will be £15 for the day (£5 concession). Pre-booking is essential, through the British Library’s Box Office, which can be accessed online (http:/boxoffice.bl.uk), via telephone (+44 (0) 1937 546 546), or in person at the Information Desk at the British Library. 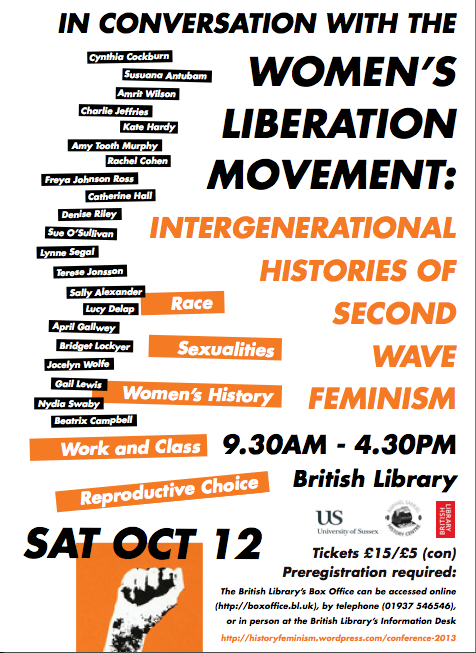 ‘In Conversation with the Women’s Liberation Movement: Intergenerational Histories of Second Wave Feminism’ has been supported by the Sisterhood and After: an Oral History of the Women’s Liberation Movement project at the British Library, the University of Sussex, the Raphael Samuel History Centre, and the History of Feminism Network. 24.09.13 Please note that this event is now SOLD OUT. Please email history.feminism@gmail.com if you would like to be placed on the waitlist or subscribe to this blog and we will email if more tickets become available. If you have purchased a ticket but are now unable to come, please let us know. Thank you. Please contact Sarah Crook at s.r.crook@qmul.ac.uk or Signy Gutnick Allen at signy.t@gmail.com with any questions about the event. Find the History of Feminism Network on Twitter @HistFemNet. This event is open to all genders and none. We would like to stress that it is a trans inclusive event and we encourage trans people to join the discussion and share their views on feminism and history. Thanks to the See Red Women’s Workshop for the use of elements of their poster ‘As long as women are not free, the people are not free’ . See their website seeredwomensworkshop.wordpress.com for more information. Please click here for the conference call for papers. Please click here for the conference programme and abstracts. Please click here for the contact details of the individuals who spoke at the conference. I don’t seem to be able to find a link to book on the website – when I click on events, it’s only showing me events for September, and not October. I was also wondering who exactly qualifies for “concessionary” entry – is there a low-waged concession? Sorry to hear that you’ve had problems accessing the site! The link to October events on the BL box office site should be to the left of the page, under the BL logo and the September tab. You can also buy tickets by calling the box office. Concessions are for unwaged, seniors, friends of the British Library, under 18 and students. We are keen to make the event as accessible as possible, however, so do let us know if it’ll be a considerable problem.